Altium Limited, a Global Leader in Electronic Design Automation, Announces Launch of Altium Designer 15.1. New Release Adds Several New Features for Improved Design Productivity, Enhanced Design Documentation, and High-Speed PCB Design Automation. Altium has released the newest version of the company’s flagship PCB design tool, Altium Designer 15.1. Included in this release are a number of new features to improve design efficiency with expansions to productivity, documentation, and high-speed design. The newest update to Altium Designer is available now for all Altium Subscription customers. The new features in Altium Designer 15.1 focus on improvements to the entire design ecosystem, from a design’s inception with electrical designers to the completed pcb with fabricators. While new productivity high-speed design features keep PCB designers at the top of their productivity game, numerous documentation features expand the communication of design intent to fabricators and project managers. High-speed design configurations for length matching rules can now be configured in an easy-to-use wizard that automatically accounts for T-branches, components, signal pairs, and groups, greatly reducing the time spent on setup for high-speed designs. PCB designs can now be exported as 3D PDFs, allowing anyone with a compatible PDF viewer to view and rotate a design in 3D. Boards can easily be navigated with individual component selection, providing greater accuracy and design intent to fabricators. Surface layers for rigid-flex designs can now be added with “bikini” coverlays that are fully visible in 3D and can be configured with the designer’s specific material needs. Coverlay edge clearance and expansion rules have also been added to the design rule options, providing users with precise control over coverlay applications. Pad and vias can be easily be managed in a pad and via library, allowing users to define custom templates for pad shape and size. Templates can then be applied to specific groups of pads on a PCB for easy application, saving countless hours defining pad options individually. The addition of a new Unions panel helps to better organize design data and align Union data with other PCB objects in a design. The Union panel will show a hierarchical view of Union types, Unions, and Union primitives for easy reference. 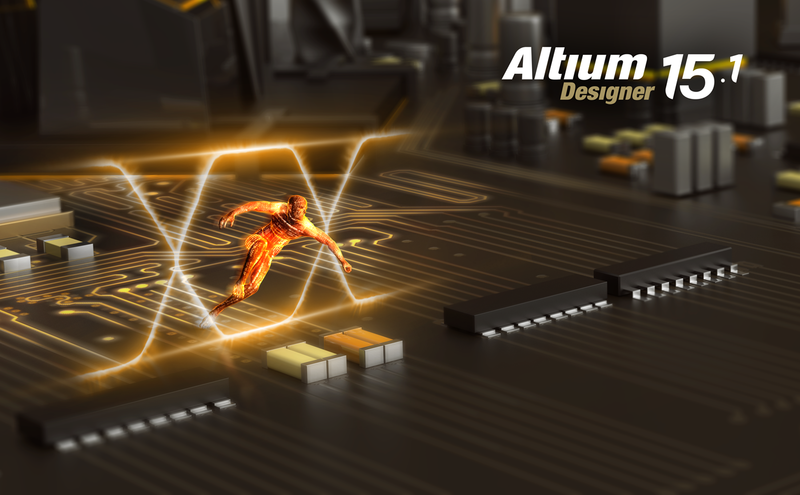 Overall, Altium Designer 15.1 expands upon an already robust set of features aimed at making the design process even quicker and easier for today’s electronic designs. You can view the Altium Designer product page for a full overview of all the features added in Altium Designer 15.1. Now is a great time for designers to make the switch to Altium Designer. Take advantage of all the new features in Altium Designer 15.1 and start a free trial today.